Lots of high performance dual band wireless ac routers available in the market today. Which one is the best dual band router, the best home wifi router based on wireless AC technology offered by Netgear, Asus, TP-link, D-link and Trendnet? Wifi technology develops very fast. You probably have not yet upgraded your legacy wifi G-based devices to wifi N-based devices, the new 5th generation of wifi technology (802.11ac) with gigabit speeds has been applied to various models of wireless devices including dual band wireless routers. Probably the fastest wireless N router you have today is wireless N900 router such as Asus RT-N66U N900 dual band router or Netgear WNDR4500 N900 router. With this N900-based router, each band delivers speed up to 450Mbps. Today, you may find wifi N speed is boosted up to 1000Mbps at 2.4GHz band in some models of high speed wireless AC routers. While at 5GHz band, the wifi AC is boosted with quad stream technology to deliver speed up to 2100Mbps. In two band routers, you can find high speed wireless AC2600 router which theoretically delivers dual band network with total bandwidth of up to 2600Mbps. Couple of months after the emerging of wifi devices based on this AC2600 technology, the faster wireless AC3100 dual band routers were introduced by some networking vendors. Both models of AC2600 and AC3100 routers are best home wifi router for streaming 4K video, online gaming and other demanding high bandwidth applications. 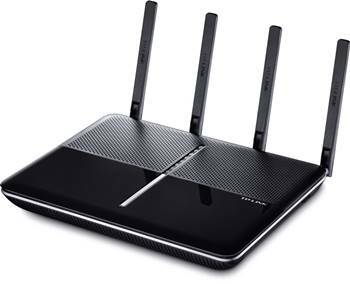 The following products are top 5 high speed dual band wireless ac routers you may consider, the flagship products in two band router category offered by Trendnet, TP-link, D-link, Asus and Netgear. 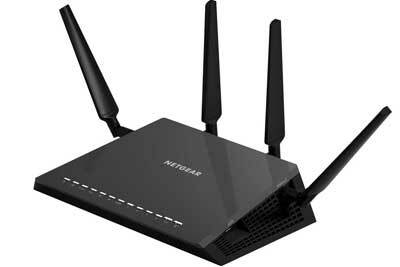 Netgear is successful with the previous version of Nighthawk X4 AC2400 two band router. And then Netgear boosts the speed to the next step to AC2600 two band router on Nighthawk X4s. Netgear X4s demonstrates its performance to higher level than other competing products and it becomes very successful in the market, the best dual band router in AC2600 technology so far. This model is also known as Netgear R7800-100NAS, it was released long time after the successful product of AC3200 router. Netgear so far releases AC1200 adapter (Netgear A6200) to accompany your high speed network. Should you require to boost wifi connection for your computers to connect to your high speed AC network, upgrade your wifi adapters with high speed USB AC1900 adapters. See also top 5 USB AC wifi adapters. The next level of two band router is the AC3100 router which later becomes the next step to the production of AC5300 three band router. with AC3100 technology the router delivers two band network with speeds of up to 2100Mbps @5GHz band and up to 1000Mbps @2.4GHz band. Asus RT-AC88U is the best home wifi router offered by Asus in two band router category. Twice number of gigabit LAN ports than other routers in general. Moreover, the capability of ports aggregation is a plus other routers do not support. Large coverage up to 5400 sq. ft.
Asus RT-AC88U is one of best dual band routers you may consider for upgrading your aging routers. 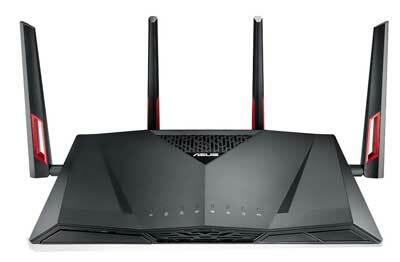 And so far, the most powerful router that Asus offers is RT-AC5400 router. In addition of existing DIR-890 AC3200 three band router with 6x external antennas, D-link introduces another higher speed AC3100 router DIR-885. However this model is two band version instead of three band version @ AC3100 network segment with four external antennas, the same technology offered by Asus RT-AC88U as discussed above. DIR-885 is the best home wifi router offered by D-link in two band technology, while for next step in three band router based on this model is the D-link DIR-895 AC5300. You may pair this product with high speed D-link DWA-192 AC1900 to get the optimum data rate throughput between your computers and the router. Another variants of high speed AC router in two band version after the successful product TP-link Archer C9, TP-link introduces new TP-link AC3100 router. This product is the fastest router in two band wifi AC segment introduced by TP-link. if you compare TP-link AC3150 with the previous Asus RT-AC88U and D-link DIR-885, all the three routers are powered by the same 1.4GHz dual core processor for much better performance. 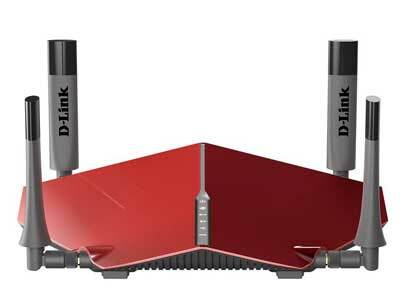 TP-link AC3150 is one of best dual band router with affordable price you may consider for upgrading your aging router. you may pair your desktop computers with PCI-e AC1900 wifi adapter to optimally connect to high speed AC3100 router. 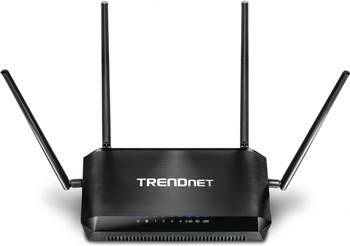 TEW-827DRU is the best dual band router offered by Trendnet with AC2600 technology. Unlike the other models that commonly come with internal antennas, the TEW-827DRU model comes with four external antennas with beamforming technology. Nearly the same design as the three band model Trendnet TEW-828DRU that comes with six external antennas like other three band routers with AC3200 technology. The price is tagged about $140 in some online stores including Amazon with good customer rating. Those are high speed dual band wireless ac routers for homes. For businesses you may consider business class wireless ac access point such as Ubiquiti, Linksys, Alfa and still more. See top 5 business class AC access point.